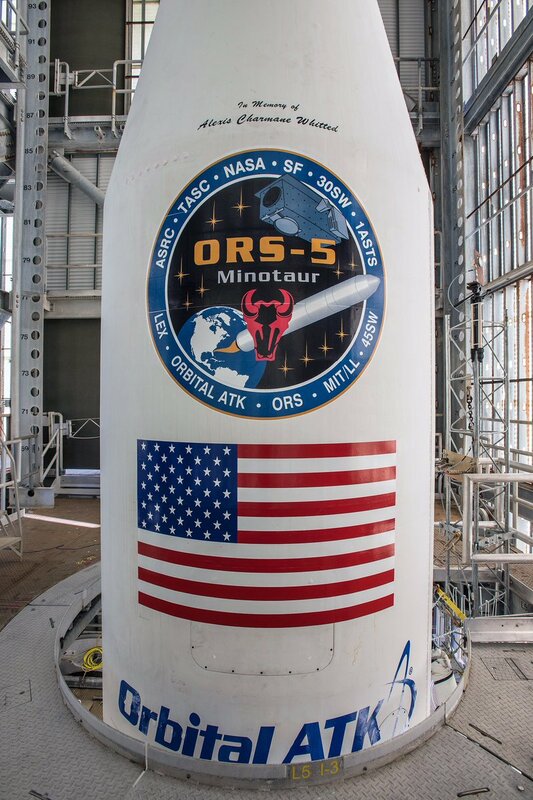 Orbital ATK’s Minotaur rocket is set for its first launch from Cape Canaveral Friday night, tasked with carrying into orbit the ORS-5 mission for the U.S. Air Force comprising the SensorSat space surveillance spacecraft and three CubeSats riding shotgun with the primary payload. The mission has a four-hour launch window opening at 3:15 UTC on Saturday, 11:15 p.m. local time on Friday. Friday night’s mission is one for the history books as the first flight of a Minotaur rocket from Cape Canaveral and it will also set the record for the largest inclination change ever carried out in Low Earth Orbit, aiming to place the 113-Kilogram SensorSat into an equatorial orbit from where it can monitor activity in the Geostationary Belt where the world’s communications, TV and weather satellites reside. The mission uses a modified Minotaur IV rocket, featuring the standard stack of three government-furnished Peacekeeper missile stages and a solid-fueled Orion 38 acting as fourth stage plus another Orion 38 sitting on top to complete the major plane change from the initial parking orbit inclined 24.5 degrees into an orbit with zero inclination, directly above the equator. Geostationary Orbit is arguably among the most important orbital regimes for commercial and government communications, meteorology and intelligence-gathering. Given its importance for national security, there is a strong desire to monitor activity in Geostationary Orbit to identify threats arising from a large population of debris and zombie satellites as well as potentially purposeful action by a foreign entity to impede the operation of another nation’s space assets. 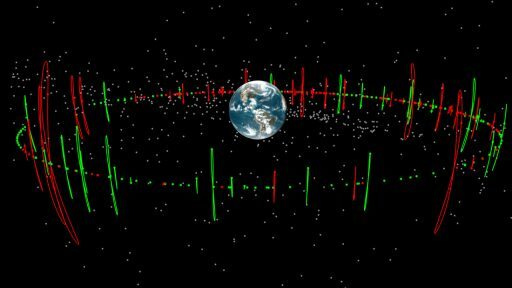 Space Situational Awareness (SSA) has received growing attention in recent years as several countries develop space systems that could potentially be used for harmful action against another satellite. SSA can be accomplished through tracking sizeable objects with radars or optical sensors on the ground as well as space-based systems monitoring activity from different orbits to deliver advance warning of any potential threats. 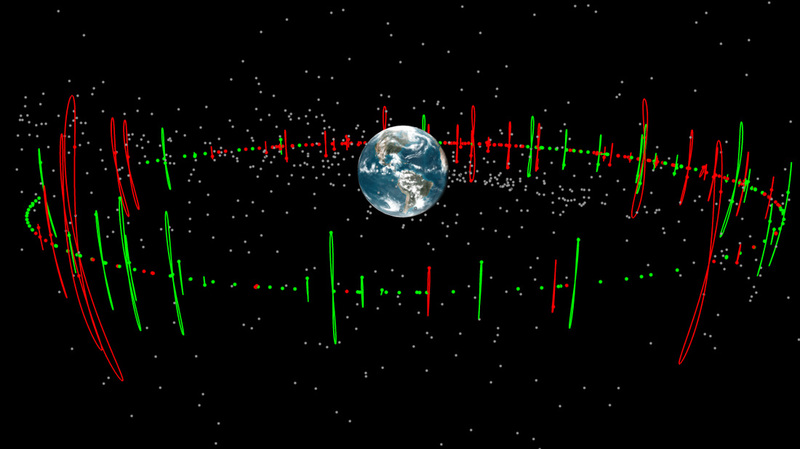 The U.S. currently operates two pairs of ‘patrol satellites’ under the Geosynchronous Space Situational Awareness Program, using optical sensors for close-up characterization of objects in Geostationary Orbit and likely employing radio sensors to track radio emissions from satellites as an indicator of satellite identity and activity. The GSSAP satellites typically roam below and above GEO and have extensive maneuvering capabilities to link up with any object of interest. Although GSSAP is useful for close-up characterization, the satellites can only monitor a small sector of the GEO Belt and can not deliver an overview of activity ongoing throughout the GEO regime. 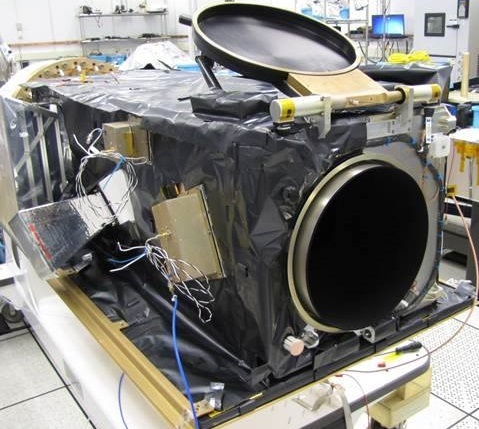 This is where SensorSat comes in – circling the Earth 600 Kilometers above the equator and staring up 35,000 Kilometers to Geostationary Orbit with a high-fidelity optical system to scan each object in GEO more than a dozen times per day. 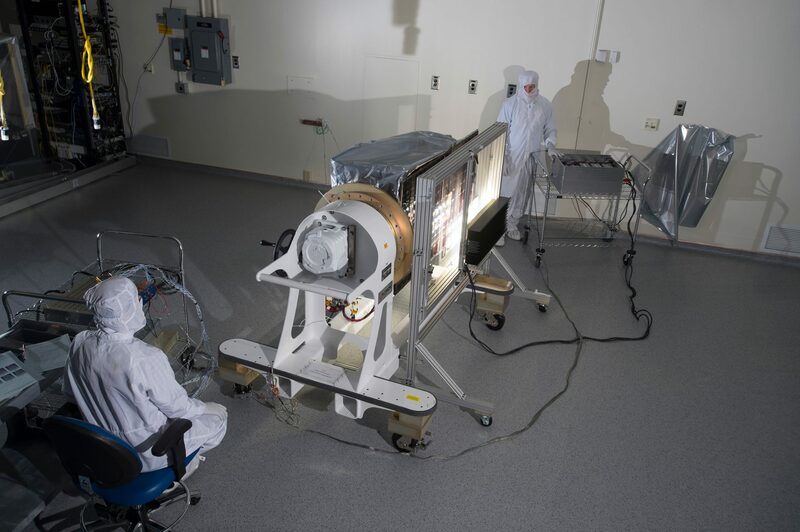 SensorSat is a gap filler between the Space-Based Space Surveillance System SBSS-1 pathfinder launched in 2010 and an operational SBSS solution that has yet to be funded. Developed at MIT / Lincoln Lab, SensorSat comes with a price tag of $87.5 million including the launch vehicle – only a tenth of the SBSS-1 project as cost was made a primary driver of this mission to demonstrate cost-effective technology that is sufficient for Geosynchronous SSA and to develop an enabler mission for future responsive, taskable sensors for various applications. SensorSat’s secret lies within its observation geometry that revolves around what is known as the ‘magic angle’ – pointing the spacecraft’s telescope to a portion of the GEO Belt well ahead of its own position so that the sensor’s velocity perpendicular to its line of sight exactly matches the target satellite velocity perpendicular to the vector joining the two. This way, the target satellite can remain momentarily motionless against the celestial background, allowing for longer exposure times to create a much higher sensitivity & pick up fainter (smaller) objects. SensorSat will operate in a circular orbit 600 Kilometers in altitude, at zero inclination. Over the course of the mission, the satellite’s altitude will decline as a result of drag, requiring constant adjustments to maintain the magic angle with decreasing altitude. The satellite is expected to operate for at least three years and prove the concepts for a possible future constellation of optical spacecraft keeping tabs on activity in GEO and other orbits. 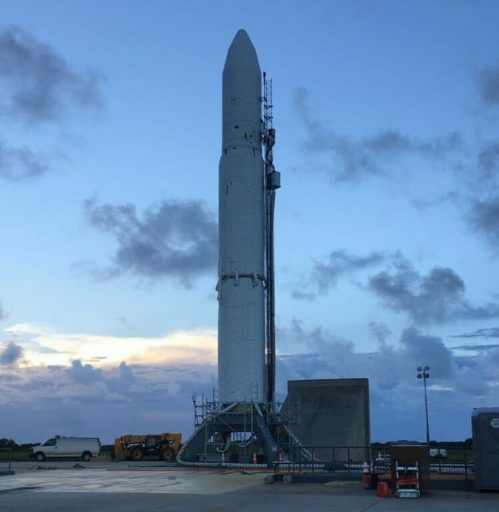 Called upon for the launch of SensorSat is Orbital ATK’s Minotaur IV rocket, flying in a modified version to accomplish the equatorial injection. The Minotaur family of rockets is operated by Orbital ATK under the Orbital/Suborbital Program (OSP-3) by the U.S. Air Force that combines government-provided missile stages from the Peacekeeper and Minotaur programs with commercial upper stages and avionics to create cost-effective launch systems for government missions. 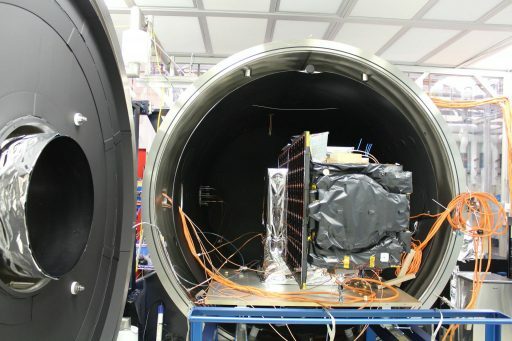 As a cost-driven mission, SensorSat was looking for cheap launchers and settled on the Minotaur IV with a launch cost of $27.2 million, significantly less than a fully commercial alternative like Orbital’s Pegasus. It will be the 26th launch for the Minotaur family and the first from Cape Canaveral, using Space Launch Complex 46 that was utilized for Trident II test flights in the 1980s, Athena launches in the 1990s and has since been turned over to Space Florida for commercial and government use. 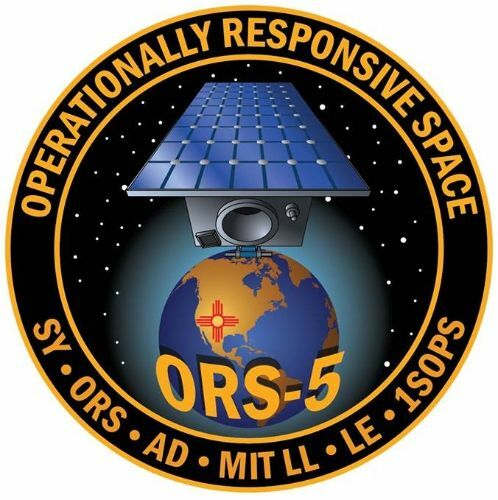 SLC-46 will be the site of the ORS-5 mission, support the Orion Crew Vehicle Ascent Abort 2 test in 2018 and has been chosen by Vector Space Systems for their Vector-R space launch vehicle. Minotaur IV, a family of launchers comprising a lite, baseline and IV+ version, has flown five times since 2010 on two sub-orbital and three orbital missions, using Alaska’s Kodiak launch complex and Vandenberg Air Force Base in California. 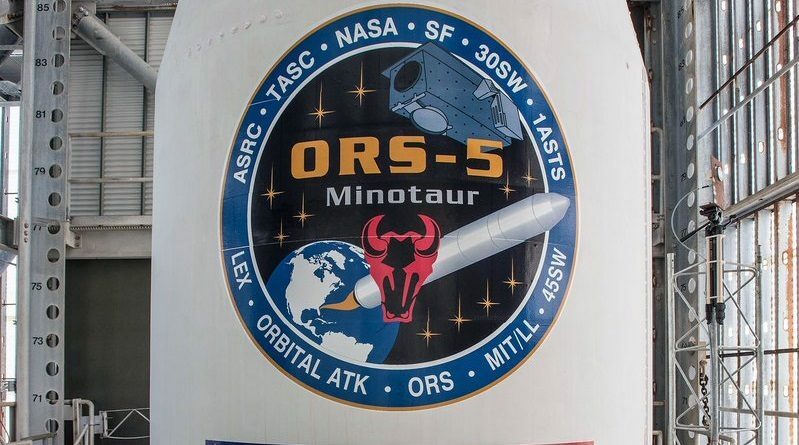 Although launch capabilities for Minotaur IV exist at the Wallops Flight Facility, the ORS-5 mission needed a site closer to the equator in order to achieve its target orbit and Orbital ATK opted for Cape Canaveral after also studying the possibility of launching from the Guiana Space Center in South America. The Minotaur IV version flying Friday night is a five-stage vehicle, using three Peacekeeper stages that will fire in close succession and an initial Orion 38 Solid Rocket Motor will inject the stack into an orbit near 600km in altitude and at the Cape’s typical inclination of 28.5°. Three government-operated CubeSats will be dropped off in this initial orbit followed by the firing of the second Orion 38 that will accomplish the reduction of inclination into the desired equatorial orbit. 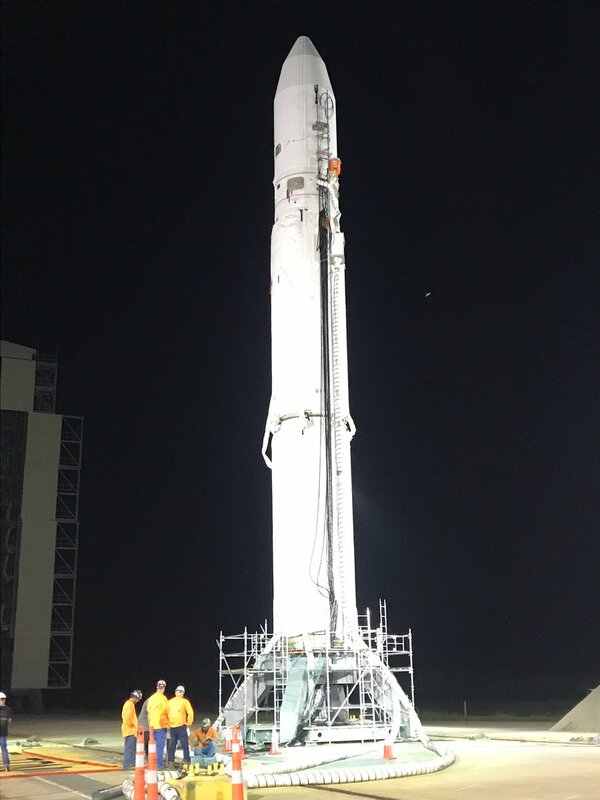 Minotaur IV stands 23.9 meters tall, is 2.34 meters in diameter and weighs 87 metric tons at liftoff, capable of placing up to 1,591 Kilograms into Low Earth Orbit when flying in its baseline four-stage configuration. As an all-solid launch vehicle, Minotaur does not require dynamic countdown events like propellant loading, using a compressed testing timeline to validate all onboard avionics are functional before pressing into final preparatory steps like flight software load, transition to internal power and flight termination system arming in the final minutes of the count. Thundering into the night, Minotaur IV will fire its SR-118 first stage for 56.5 seconds, delivering 227 metric-ton-force of thrust and consuming 45 metric tons of solid propellant. The first stage will accelerate the vehicle to a speed of 1.32 Kilometers per second, separating from the second stage 25.7 Kilometers in altitude. SR-119 generates 125 metric ton-force of thrust for a burn of 58 seconds to boost the rocket’s speed to 3.9 Kilometers per second, burning 25 metric tons of propellant. Thrust tail-off on the second stage will be followed by 11 seconds of coasting before staging at an altitude of 105.5 Kilometers, with the third stage immediately igniting on its burn of 72.6 seconds. Generating 29.5 metric tons of thrust, the third stage will accelerate the stack to a speed of 6.88 Kilometers per second, placing the two Orion 38 stages and payload assembly onto a sub-orbital arc. There will be a 10-minute and 27-second coast phase to allow the stack to climb from 194 to 571 Kilometers in altitude so that the initial Orion 38 burn can inject the stack into a Parking Orbit. Stage 3 separation is planned 13 minutes and 44.4 seconds after launch, to be followed by Stage 4 ignition at T+13:55 for a burn of 66.6 seconds. Orion 38 is 1.34 meters long and 0.97m in diameter, packed with 770 Kilograms of propellant to deliver a peak thrust of 3,765-Kilogram-force, using energy management to accomplish accurate orbital injections. The first Orion 38 is tasked with lifting the stack into an orbit of approximately 400 by 600 Kilometers, 24.5 degrees. Minotaur IV will release three CubeSats during a ten-minute coast phase after fourth stage burnout, starting two minutes after thrust tail-off with 30 seconds in between deployment events. Seattle-based Spaceflight Industries arranged the secondary payload flight opportunity on the ORS-5 mission for two 1.5 CubeSats built at Los Alamos National Laboratory and a 3U CubeSat for the Defense Advanced Research Projects Agency, DARPA. Separation of the fourth stage is expected 25 minutes and eight seconds into the flight and the second Orion 38 will ignite 11 seconds later, completing its firing out of plane to reduce the orbital inclination to zero degrees and raise the low point of the orbit to reach the target circular orbit at 600 Kilometers. SensorSat separation is targeting T+28 minutes and 28 seconds into a perfect equator-hugging orbit to begin its mission of tracking activity around Earth’s prime orbital real estate. For Minotaur, the mission ends with venting of reaction control system propellant, set to be complete at T+37 minutes.